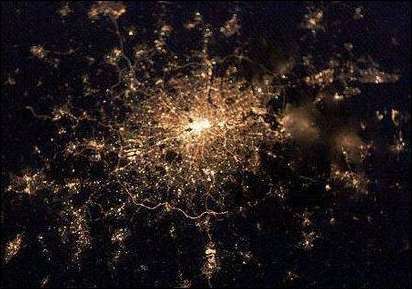 We start with a photo of London taken from one of the Space Shuttle missions. Heathrow is at the 8 o'clock position of the ring. Our destination is that bright patch in the center. Usually we take a mini-cab (an independent, or gypsy cap) as a cheaper alternative to the rather pricey black cabs. This is convenient, but we always get stuck in the terribly traffic and are a bit grumpier by the time we actually arrive in the city. This time we've packed our 48-hours-in-London gear into a small carry-on suitcase and checked the rest. We've retrieved those bags, placed them into the "baggage left" department at Terminal 2, and will use the London Underground. It's GBP 5.50 per bag per day, so that's about $60 for both days. About what it would cost for a cab both ways. Isaac absolutely loves the London Underground. I've asked him whether there's anything better the Tube, and his adamant answer is no. When he's stopped smiling. Here we are just after boarding. The station sign - "Heathrow Terminals 1, 2, 3" - can be seen through the open door. You might recognize the sign at the left edge of the photo: it's the Above Ground Picadilly Line poster we have in our dining nook. We've really adopted the Picadilly Line on this trip, as you'll find out. Once we get underway Isaac is transfixed by the goings-on outside in the stations and the above-ground town scenes. Lila is showing off her candy necklace; quickly devoured. And Rose is enjoying a British tabloid. The Picadilly line takes us to Russell Square, and our hotel is only a few moments walk away. It's a very two-star sort of place: convenient and cheap, and a perfectly adequate place to sleep through the night, but nothing else at all. There's a café in the courtyard with free WiFi. We're very, very tired. The night flight has shaken us up, but we're going to try our usual strategem of staying awake until it's appropriate to sleep. It's just after noon, and so we figure we have to stay moving for at least six hours before we can put the kids through a bath and put them to bed. A half-block away I see too much plywood to make me happy. Yep, the place went up in a grease fire, a fire so ferocious it made the papers (I'm told), and is now in limbo. I'm not getting my kebabs, nor Rose her fish 'n chips. But what to do now? 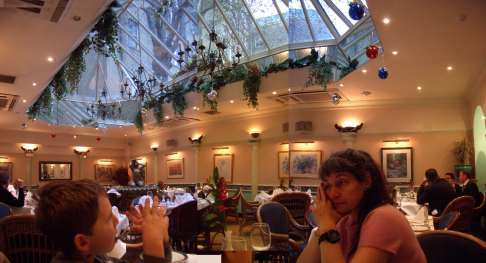 We head back hoping to find one of the small restaurants we like to discover, and quickly enough we find a beautiful Indian restaurant with a eye-catching skylight and absolutely delicious food. We're actually so tired that we don't really taste the food until we eat the left-overs back at the hotel room. Lila was asleep in her stroller (we were hoping to simulate her mid-afternoon nap) and Isaac was on the verge of bad behavior (but he held it together, the little trooper). Here's the view of the Reading Room as seen from the inner courtyard of the museum. They built a glass panel roof which reminds all of us of I. M. Pei's pyramid at la musée du Louvre. Our mission done we head back to the hotel to start the bedding process. Compliations must be dealt with.